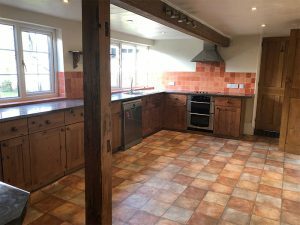 Same space, completely new feel. 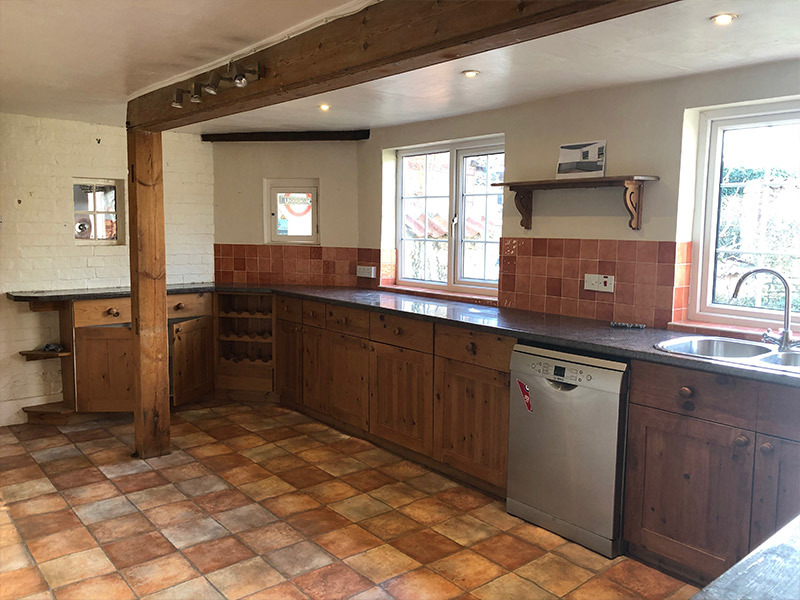 The owner of this kitchen wanted a bigger oven, brighter space and a new contemporary feel without losing the original features of this country kitchen. We think we delivered…do you? 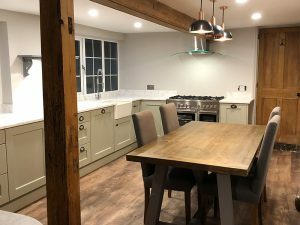 New Kitchen : Kitchen Stori, Wakefield, Sage Green. Our fitters worked with the owner’s choice of electrician, flooring and decorating specialists to create this beautiful family space. 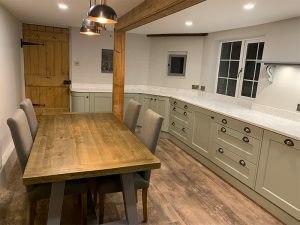 Doors – Kitchen Stori, Wakefield, Sage Green. 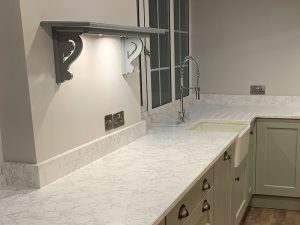 Work Tops – White Venato Quartz supplied by PWS. 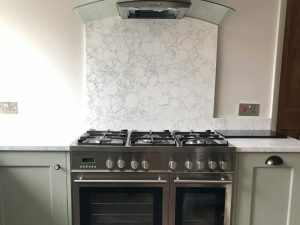 Splashback – White Venato Quartz supplied by PWS. 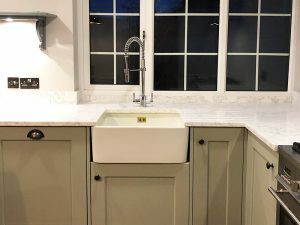 Handles – American Copper Knobs and Cup handles from Kitchen Stori. Floor – Country Oak supplied by Lincolnshire Flooring. 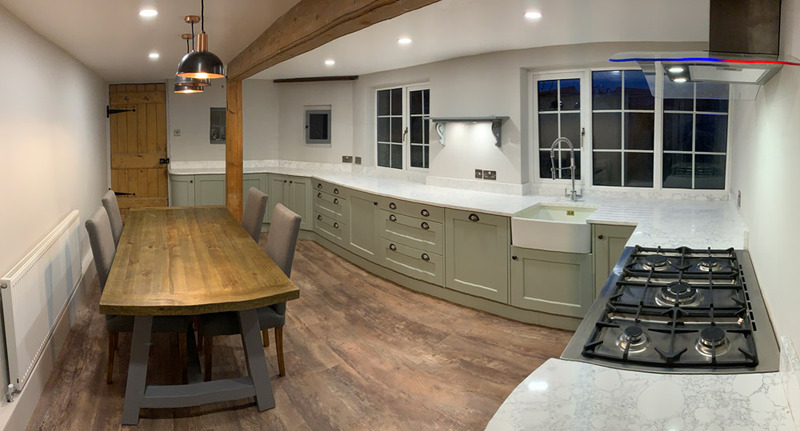 Lighting – supplied by Industville, fitted by Eagle Electrical. 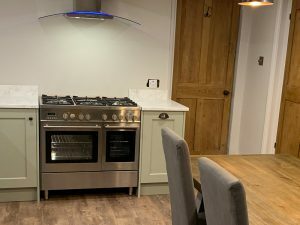 Appliances – Integrated, AEG, supplied and fitted by Cook & Sleep with a 5 year guarantee. 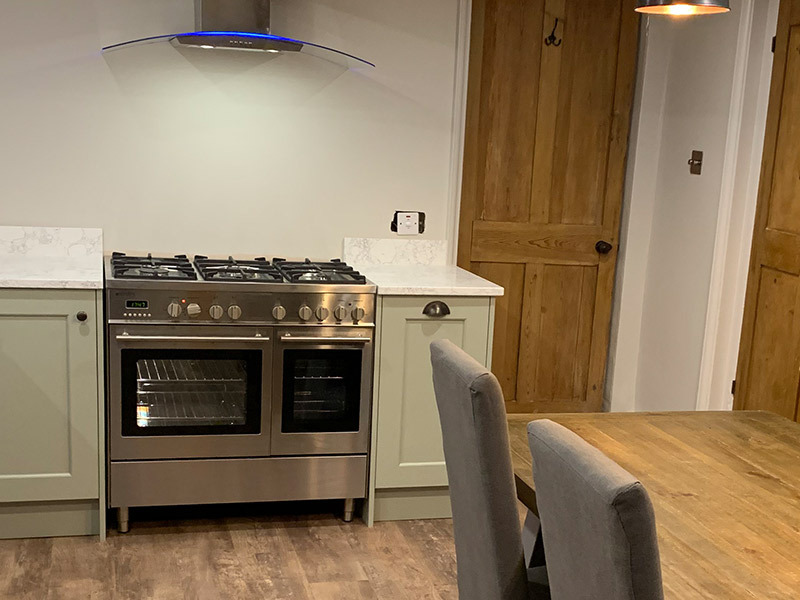 Cooker – Big Blue Range Cookers, supplied and fitted by Cook & Sleep. 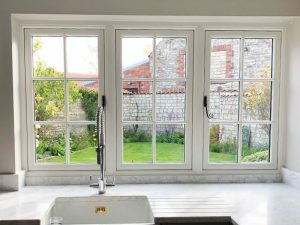 New Windows – The New Window Company. 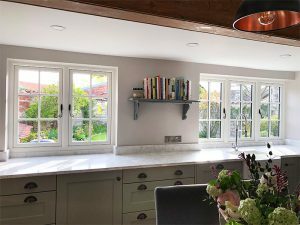 Wall Paint – Farrow & Ball Cornforth White. Quartz worktop is taken right up to the window edge finishing with a 10cm upstand, this gives a streamline effect and also increases the workspace depth. 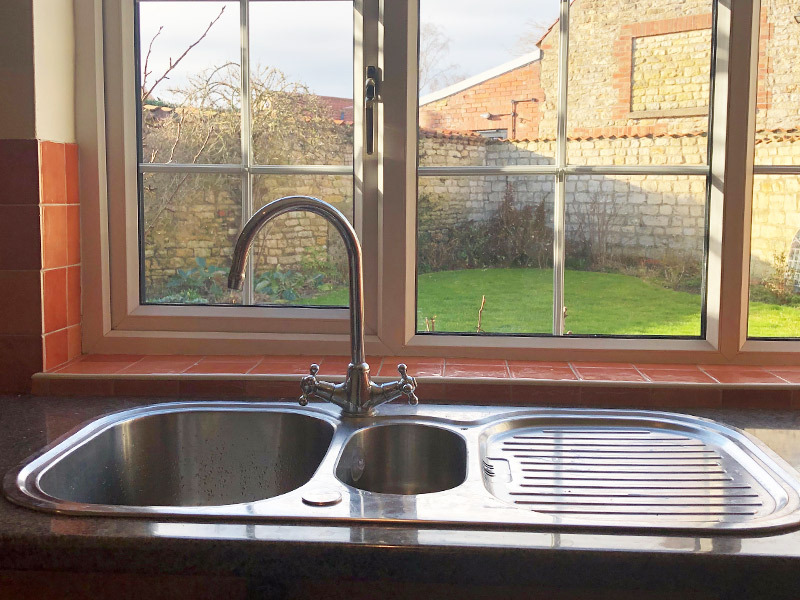 The worktop is also carried into the splashback behind the hob. Intergrated double bins situated to the right of the cooker – really useful for clearing away cooking mess as soon as it’s created. 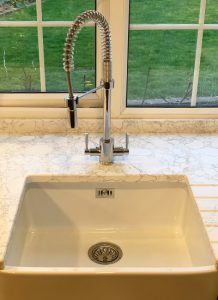 Belfast Sink (sometimes called an apron sink) – oversized and beautiful. 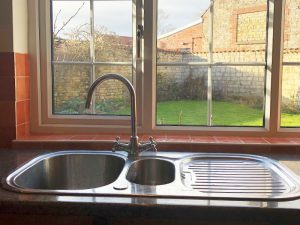 It provides lots of space without having to lose workspace for a double sink. Grooves are worked into the worktop which removes the necessity to invest in a separate drainer unit, whilst helping to drain standing water. 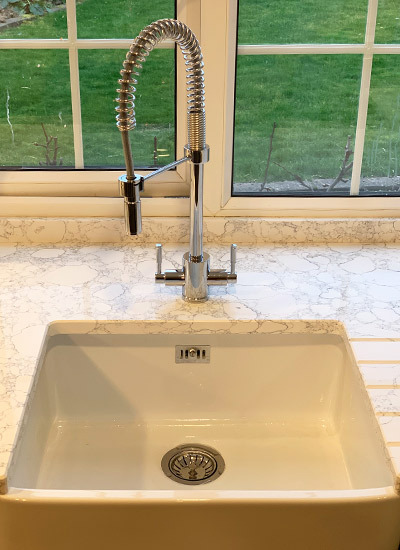 Aquatrend spring kitchen tap, great for helping you get into every corner of your pots and pans as well as around larger sinks. Plenty of drawer space for storage and easy access. 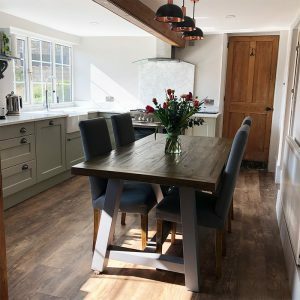 This project took 10 working days and we worked to a brief and budget to suit the client. 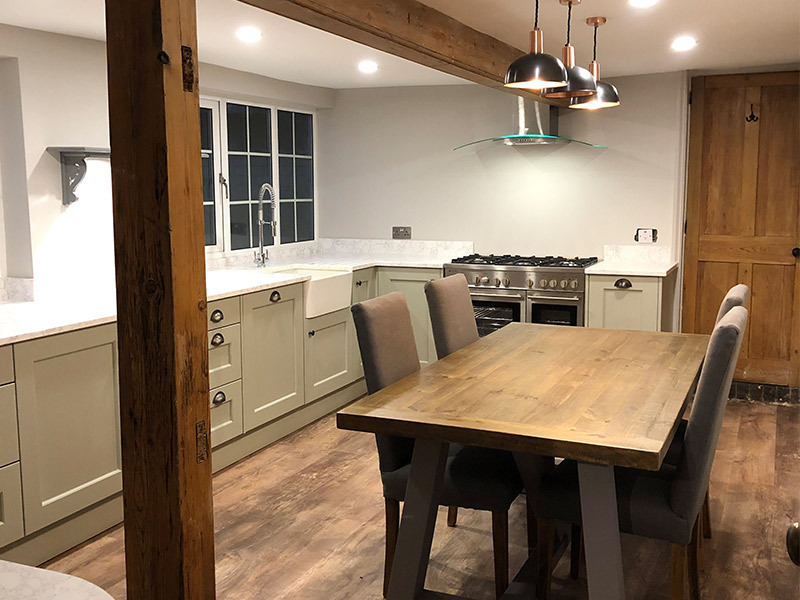 I am beyond thrilled with my new kitchen. I enjoyed the design phase, got through the messy phase and now I am in the smug phase because everything is so clean and beautiful!! Ed and his team were brilliant, really knowledgeable and patient. 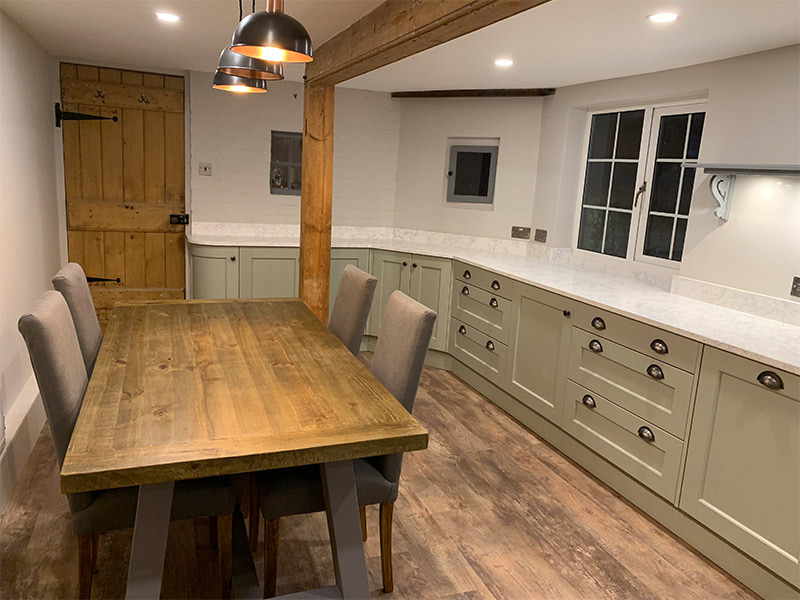 The fitters were fab, no let downs at all. 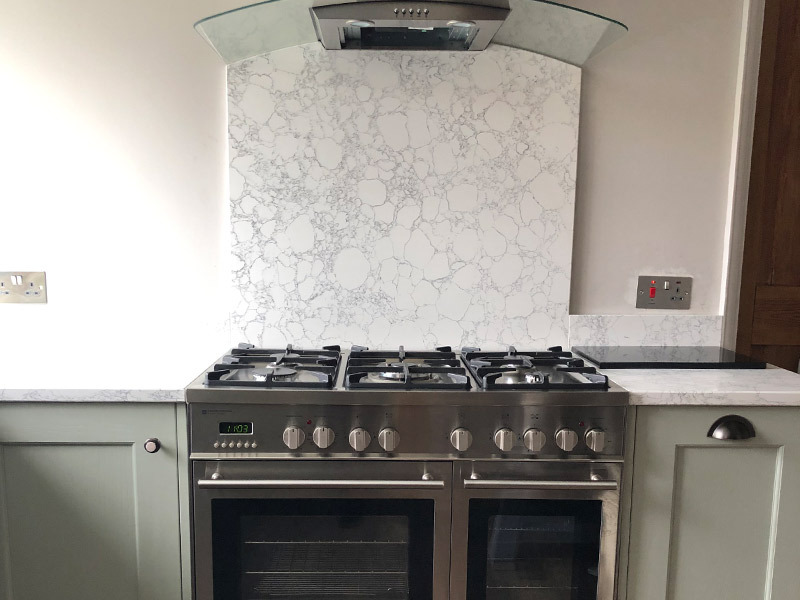 If you want a bespoke but affordable kitchen you need to speak to Cook & Sleep. 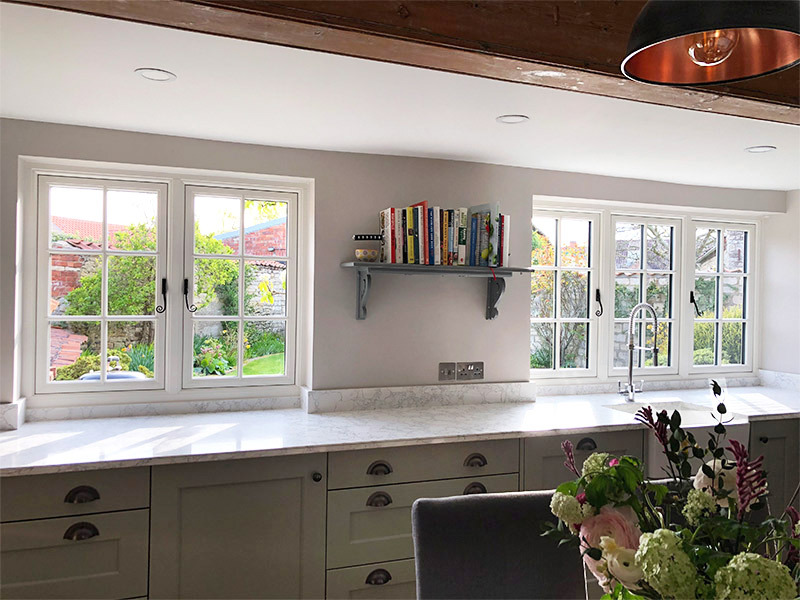 The final part of the project was for The New Window Company to install beautiful Evolution timber alternative windows; perfectly in-keeping with the country cottage kitchen. Our kitchens are bespoke and we provide design options to suit all budgets. If you are thinking about having a new kitchen we offer supply only or supply and fit options. 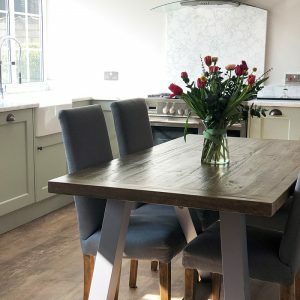 We will help you get the best design to suit your budget. You can take your time to decide and visit our showroom as many times as you need to before committing with no obligation. 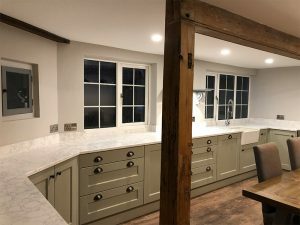 To see other projects please see our gallery. 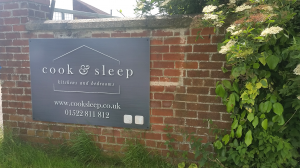 Visit the showroom Monday – Friday 9-5 or Saturdays 9-1. Please contact us if you have any questions.